Captive-bred Cortez Angelfish, Pomacanthus zonipectus, have landed in the U.S. and are available now through marine aquarium fish wholesaler Quality Marine in Los Angeles, CA. Quality Marine is proud to announce the arrival of yet another new aquacultured species: the juvenile Cortez Angel (Pomacanthus zonipectus). Their unique, vibrant colorations as juveniles and adults, coupled with their rarity, make them highly sought-after in the aquarium trade. Like many angelfish, the adults and juveniles have very different coloration patterns. Cortez juveniles are black in color, with blue and yellow half-circle markings. Adults are blue with a pale yellow, speckled mid-section and some yellow markings posterior of the eye. Having this aquacultured species here is a first for Quality Marine, and possibly the United States. At Quality Marine, we strongly believe that aquaculture and short supply chains are essential for the long-term viability of our trade and for the health of our oceans, which makes successful captive breeding all the more important. This Cortez Angel currently boasts the juvenile coloration of the species. In the wild, Cortez Angels inhabit reefs of depth from 6 to 50 meters all throughout the waters of the Eastern Pacific to the Southeastern Pacific Ocean. They feed primarily on sponges, tunicates, algae, bryozoans, and eggs. Adults can be found in pairs and sometimes small aggregations. However, juveniles are more territorial and are usually solitary. Cortez Angels are very hardy and can do quite well in home aquariums as long as they have sufficient swimming space and a balanced diet. 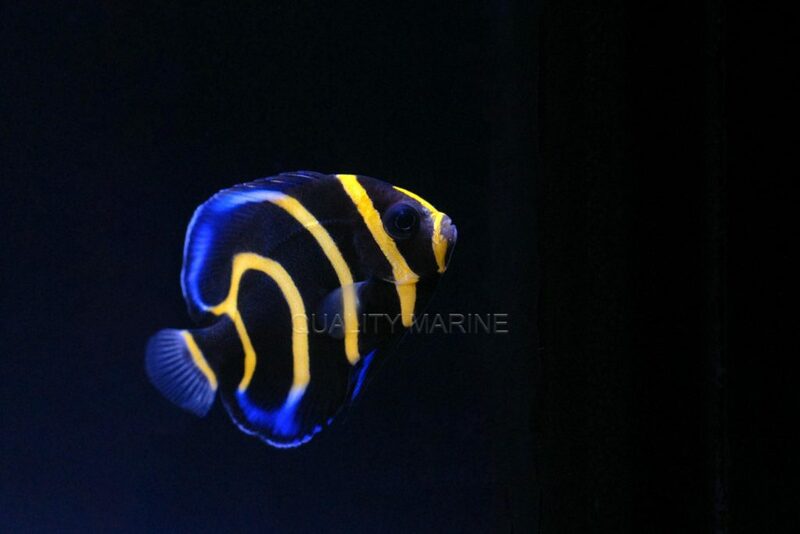 The largest obstacle with this angelfish is ensuring that their nutritional requirements are met. Cultured specimens are raised on prepared, often frozen meaty foods, which decreases the obstacle of getting them to eat. Their natural diet also helps explain why they make risky reef aquarium candidates: they will likely consume coral polyps and clam mantles. Because these can get to over a foot long, at full size a very large aquarium (at least 200 gallons) will be needed. (It will take several years for a juvenile to reach such a size.) 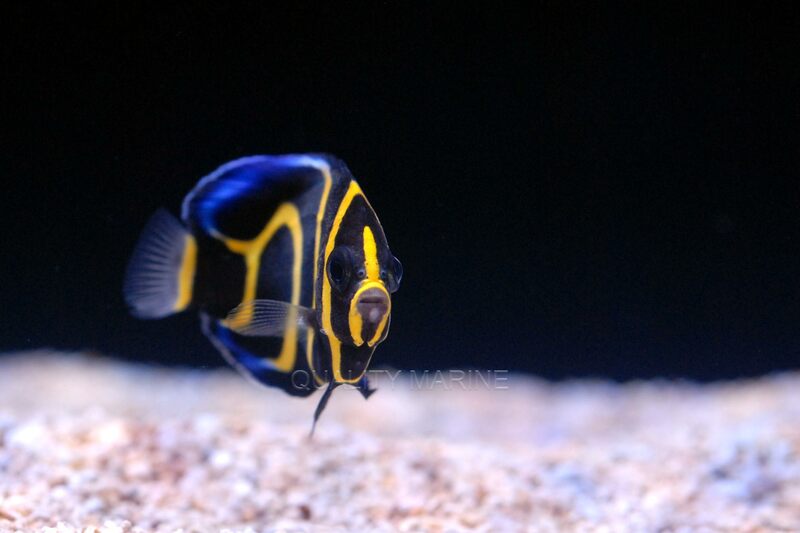 The Cortez Angel, especially the juvenile, should be the only angelfish in the aquarium. In time, this juvenile captive-bred Cortez Angelfish will grow to require an aquarium of at least 200 gallons in size, so plan accordingly. Increasing the number of cultured species we offer to our customers is an integral part of making the aquarium trade more sustainable. Quality Marine has supported these aquaculture efforts for decades now and will continue to offer the best and widest variety of aquacultured specimens anywhere. 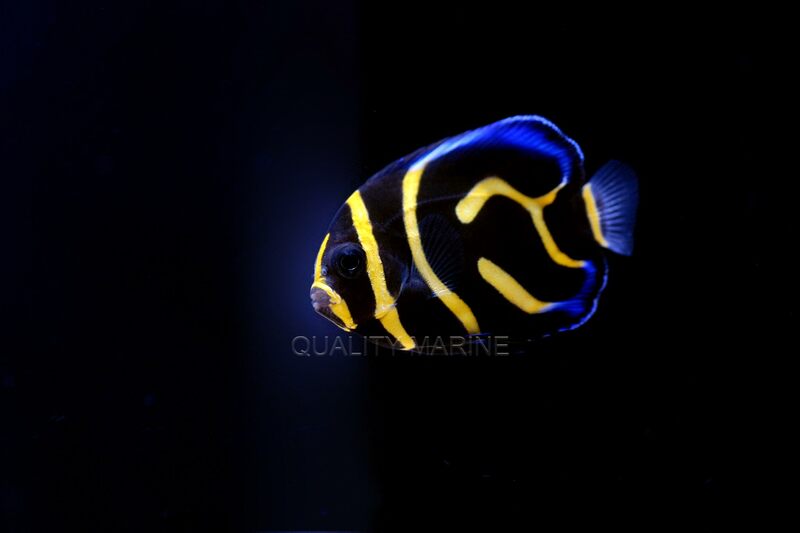 Quality Marine is very proud to now offer the juvenile Cortez Angelfish to our ever-growing list of captive-bred species offered.